My dermatologist prescribed this face wash to me. She said it would dry out my cystic acne in a couple of weeks. My face is literally the WORST it's ever been in my entire life. 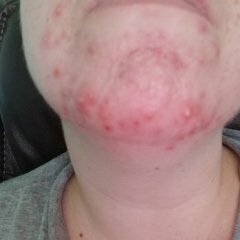 My entire chin area is covered in huge, painful pimples that hurt to the touch. As well as my upper lip area. These are normally my 'problem areas' and I never imagined they would get this bad. I cant wash those parts of my face right now without pain. My derm. basically told me oh well it happens keep using the wash. If I could upload the pics I took of my chin and upper lip area, you would see what I mean. I dont even want to leave my house it's so bad, even if I tried to go out, the pimples are so big they will just look like bumps with cover up on them. I will never EVER use this harsh garbage on my face again. On to my 5th dermatologist for my adult acne. I picked this up on a whim at a tiny pharmacy. Normally I use Proactiv, but this is a great alternative when I don't want to lug around an entire regimen while traveling or when I just want a break from Proactiv. I massage this in for a full minute and rinse with lukewarm water. I follow up with some oil free moisturizer, and I'm done. It definitely keeps breakouts away. This can also fill in for step one in the Proactiv system if I'm out of their cleanser. My skin has never been clearer. Tried: 1. Regimen 2. Tazorac 3. Birth Control 4. Aczone 5. 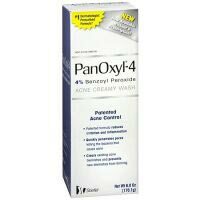 Duac I was my face with CeraVe hydrating cleanser and then layer this on top for about two minutes. Smaller pores. Fewer breakouts. Smoother and brighter looking skin. I think it's because it has glycolic acid and bp.